Beyond being one of the most famous Judo photographers, David Finch is a passionnate of our sport and he is a judoka himself. He has been following Judo events for decades. He explains us why judo is so different. How many other sports allow ordinary club players to practice with Olympic and World champions? Does Tiger Woods play golf with lowly club members, or Roger Federer tennis with a typical small club player. In fact, as a competent car driver are you ever going to race alongside Sebastian Vettel? The answer is almost certainly no. But take up judo and after a few months – well perhaps more than a few months - you could be trying to throw or even strangle Olympic and World champion, Ilias Iliadis, or even Teddy Riner. That is if you knew which clubs they were practicing at and had the time and money to be there at the time they were there. Had you been, it is almost certain you would have had the opportunity to try during the randori. Eye contact, a smile and a respectful bow and you could be flying through the air with the greatest of ease. Actually, that did happen to me although sadly not with Iliadis or Riner, they are far too young. The year was 1970 and I had just been promoted to a black belt as a member of the once famous and now non-existent London Judo Society that included amongst its members the actor Peter Sellers. A club visit was organised to Amsterdam and twelve of the club’s dan grades, including me, hired a small coach and drove there for the weekend, with one or two planning additional activities outside judo. 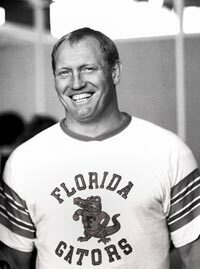 Willem Ruska © David FinchThe club practice was arranged for the Saturday afternoon but what we did not know was that Willem Ruska was going to be there and we could not believe our eyes as he walked in. Here we were twelve average or less than average club players, in a line up opposite one of the world’s most famous judoka, a World champion, European champion and competitor that almost always won the gold medal and who dwarfed all of us weighing in at 115kgs. At around 66kgs I was fourth in line. He towered above me but I was determined to attack with my notorious tai-otoshi and at the very least roll his 115kgs to the mat. There was no way that Rushka was going to beat me like he had the earlier ones in the line-up. Immediately I had him deeply worried. Not only had he launched me back towards London with a double foot sweep within five seconds but I had banged my head on landing. It was not that bad but Rushka was quickly kneeling beside me to find out if I was alright and then helping me to my feet respectfully apologising. I’d like to think that his experience of throwing me with such precision had contributed to the skills that enabled him to win two gold medals at the Munich Olympics two years later. Is an ordinary golf or tennis player or car driver ever going to be able to think that or for that matter try and match their skills against the best in the world? It is only in judo that you can do that. 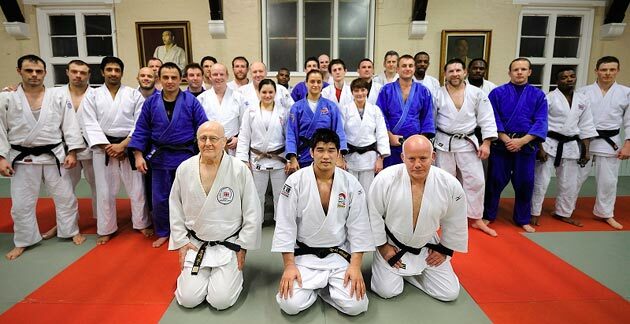 Yasuhiro Yamshita - © David FinchSince then I and others at my club, the Budokwai in London, have practised with several Olympic and World champions including Katsuhiko Kashiwazaki, Yasuhiro Yamashita, Hirotaka Okada, Kenji Nakamura and last year Kosei Inoue. 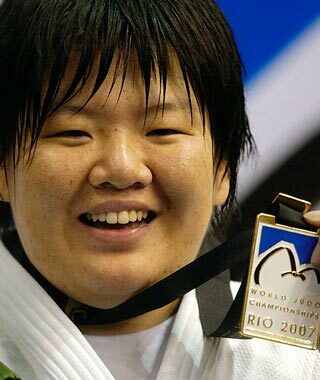 All have travelled to other clubs in the UK and currently Olympic and World champion Maki Tsukada is coaching and practising at the Budokwai and elsewhere in the UK. Two of the most important ethical aspects of judo are respect and self control. When a taekwondo former Cuban Sydney Olympic champion, Angel Valodia Matos, disagreed with the verdict of the judge at the Beijing Olympics he kicked the judge in the head. In an infamous boxing match involving former World champion, Mike Tyson, he lost his temper and bit off the ear of Evander Holyfield. Is that respect or self control – certainly not? Taekwondo means to "to strike or break with foot" while with boxing the ultimate and desired intention is to damage the opponent’s brain and knock him out. That is hardly the “Gentle Way” of judo. 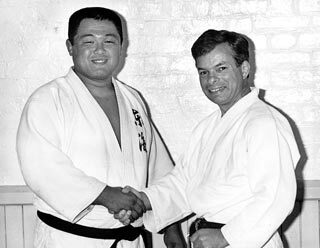 Although a lot smaller and lighter than me at 1.57 m (5 feet 2 inches) and 41 kgs I think Jigoro Kano would have relished a match with Wilhelm Ruska if he had been around in those early days of judo. However, I don’t think the result would have been any different. 1970 Graded to 1st Dan always intending to grade higher. Often entered competitions and where I got beaten would sit at the side of the mat taking pictures of the judo. Ended up taking pictures to spread the judo word rather than grading higher. 1971 Joined the Budokwai after occasionally visiting it for a couple of years. 1973 The Judo Magazine paid for me to go to Scotland to photograph the Great Britain vs. Germany vs. France match but I made a terrible hash of the pictures. When the competitors went one way I pointed the camera the other way. The magazine used a few pictures but were not very happy. I carried on taking pictures and sending them to the magazine. Then I went on holiday to Switzerland and went to the Lausanne Worlds to take pictures. Sent them to the magazine and even though they had paid for another photographer they used some of mine in the magazine. 1974 Went to Paris for the second Paris Tournament and continued to do so every year since. Photographed the 1974 London Europeans for the magazine regularly working for them in conjunction with running the family business. 1975 Joined the British Sports Journalists Association with support of John Goodbody and another journalist. Started illustrating books for Brian Jacks and others. 1980 Luckily received first Olympics accreditation. 1999 Family business went into receivership so increased involvement in judo while still working in the removal and shipping industry on a part time basis. 2011 Chosen by AIPS Judo Commission for inaugural Media Award alongside Oympic and World champion Thierry Rey. A humbling experience.